STANLEY LEVY delivers a politically incorrect and completely unfiltered look at America through the eyes of a Conservative Black Man. There are no holds barred with Stanley Levy when it comes to politics, race and The US Constitution. 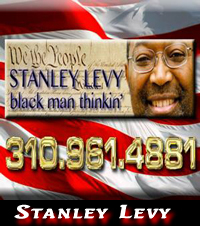 Stanley Levy takes Talk Radio Conservatism to a new level with absolutely no apologies!